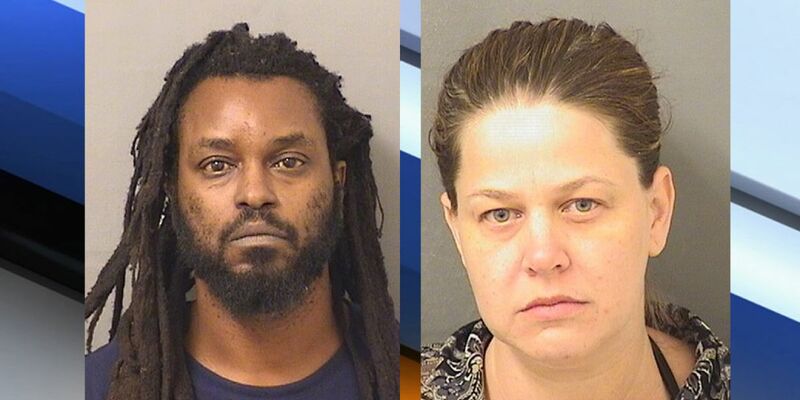 PALM BEACH COUNTY, Fla. — A Palm Beach County father is accused of using his daughter to sell drugs at school. According to the Palm Beach County Sheriff's Office, a female student at Seminole Ridge High School was caught snorting cocaine in a classroom on Oct. 29 and arrested. PBSO said the student's father claimed his daughter got the drugs from the 16-year-old daughter of 41-year-old Carnell Anderson. A School Resource Officer at Seminole Ridge said another student passed out in class earlier in the year from a drug overdose. That student claimed he bought Xanax from Anderson's daughter as well, according to the Sheriff's Office. Deputies executed a search warrant at Anderson's home at 16143 88th Road North on Jan. 14 and took Anderson and 37-year-old Stephanie Wransky into custody. The Sheriff's Office said agents found a clear plastic sack of cocaine in a master bedroom, along with three Ziploc bags of cocaine. Agents said they also found two Ziploc bags of cocaine in a pair of pants in the laundry room, and two clear plastic sacks of marijuana and cocaine under the armrest in Wransky's truck. Anderson said the drugs were his, according to agents. The Sheriff's Office also said five Ziploc bags of cocaine were found in a dresser in Anderson's daughter's room, and four Ziploc bags of marijuana were found in a Care Bears lunch box in her room. Agents said a Smith and Wesson .40 caliber pistol, along with various ammunition, was found in the garage. Palm Beach County School District Police said a School Resource Officer took Anderson's daughter out of class. She had an Altoids tin containing cocaine and prescription pills, according to police. She was arrested and taken to the Juvenile Detention Center. FOX 29 is not naming her because of her age. Carnell Anderson is facing several charges including possession of cocaine with intent to sell, possession of marijuana with intent to sell, possessing a dwelling to manufacture a controlled substance with minors present, and possession of a firearm by a convicted felon. Stephanie Wransky is facing charges of possession of cocaine with intent to sell, possession of marijuana with intent to sell, and possessing a dwelling to manufacture a controlled substance with minors present.